The Medford community is thankful for the quick action of local emergency response teams who assisted with a recent crash on Tuckerton Road. 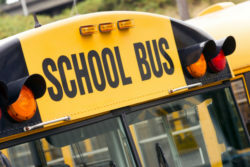 According to police reports, a dangerous chain-reaction crash involving at least five school buses and dozens of children occurred on July 16. The buses were traveling from a summer day camp and were carrying approximately 100 individuals in total. Hospitals received at least 21 children and 3 adults for treatment after the accident. While the victims sustained personal injuries, medical staff confirmed that none of the children were seriously injured in the collision. Several children were transported back to the summer day camp. The camp later expressed its gratitude to the responders who helped protect the children after the incident. Photographs from the scene revealed serious damage to several of the buses. The emergency exit doors can be seen wide open where the children were forced to evacuate, and several windshields are cracked. The front doors on one bus are visibly shattered. The highly qualified personal injury attorneys at Bramnick Law are committed to seeking out fair financial compensation for victims injured by another’s negligence. Our team of compassionate attorneys understands how frustrating it is for our clients to be facing overwhelming medical bills, physical injuries, property damage and other losses after an accident. We want to help you pursue the responsible party and claim your rightful compensation while you focus on your physical health. If you have a legal question for us, reach out to our law firm online to receive a prompt response. Who Do I Have to Notify After a Personal Injury Accident? Whether you're in the hospital, at the police station or need to speak with someone after hours, we ca help. We are available and ready to start working for you immediately.